FACTORY SPECIFICATIONS INCLUDE: METALLIC PAINT, LEATHER BUCKET SEATS,LOCKING LIMITED SLIP DIFFERENTIAL,17 CAST MAGNESIUM CUP ALLOYS, 5-SPEED MANUAL TRANSMISSION, AIRBAG DELETION. 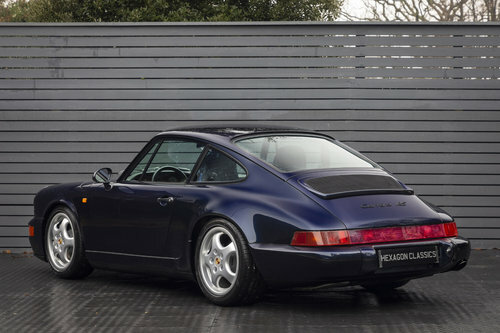 Hexagon Classics are delighted to offer this special 964 RS Lightweight. 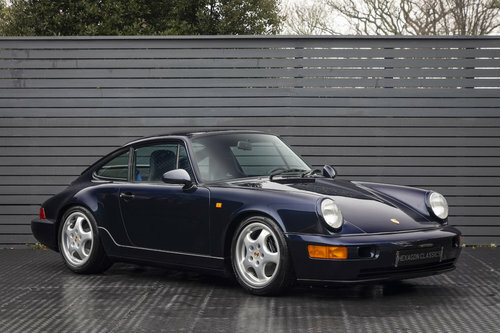 Supplied new by AMAG Porsche Ebikon, Switzerland, on 1st August 1992, this LHD 964 RS Lightweight is a genuine rarity, which will grace any serious Porsche collection. 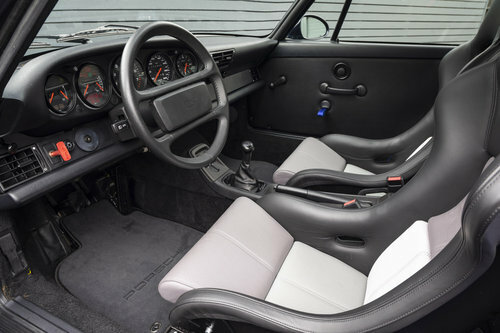 The 964 series signalled a new generation in 911 history. 85% of the components were completely re-designed, including the engine, gearbox, driveline, steering, axles, wheels, tyres, and the heating and ventilation systems. The lightweight, 260 BHP 911 Carrera RS was the first production sports car from Porsche to be given the famous “RS” designation, since the legendary 911 Carrera RS 2.7 and 3.0-litre models were produced in limited quantities in the early 1970’s. This sports car was designed for competition in Group N and Group NGT. The 911 RS was closely based on Carrera 2 Cup cars which made their successful racing debut in Europe during 1990. 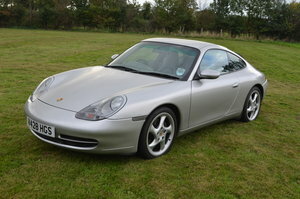 The additional 10 BHP over the standard 911 Carrera 2 twin-ignition engine is achieved via a modified engine management system. 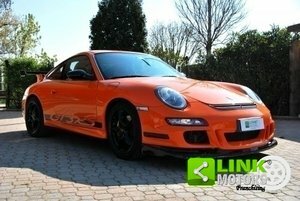 At approximately 1230 kg the RS was 10% lighter than a standard 911 Carrera 2. Manually-adjustable Turbo-look mirrors, and an aluminium bonnet, and an unheated, thinner glass rear window contributed to the weight saving. The 0 - 62 time was reduced to 5.4 seconds, and the top speed remained at 162 mph, but with better incremental acceleration times. 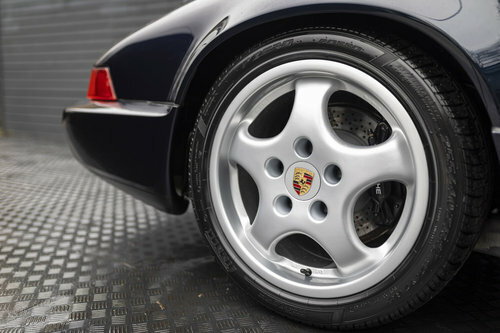 Larger, internally-vented cross-drilled 911 Turbo brake discs were used at the front, and the brake discs and callipers from the Carrera Cup car at the rear to provide extra braking performance. Cup design magnesium light alloy, five spoke wheels were also standard equipment. A sports suspension 40mm lower than standard, was uprated by the fitment of stiffer springs and sports shock absorbers. The original Service book documents a full OPC service record, with all 16 stamps present show the care and attention that has been bestowed by its previous keeper. 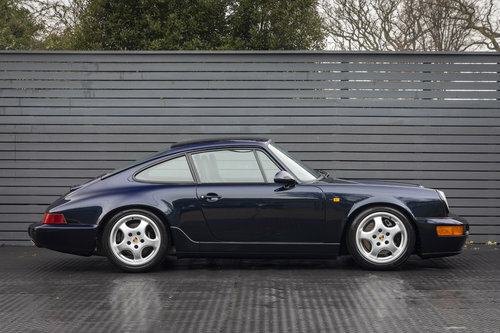 This wonderful example of the 964 RS Lightweight is available to view at our London showrooms.